Published on Friday, October 28, 2016. This article appears in the October/November 2016 issue of American Craft Magazine. 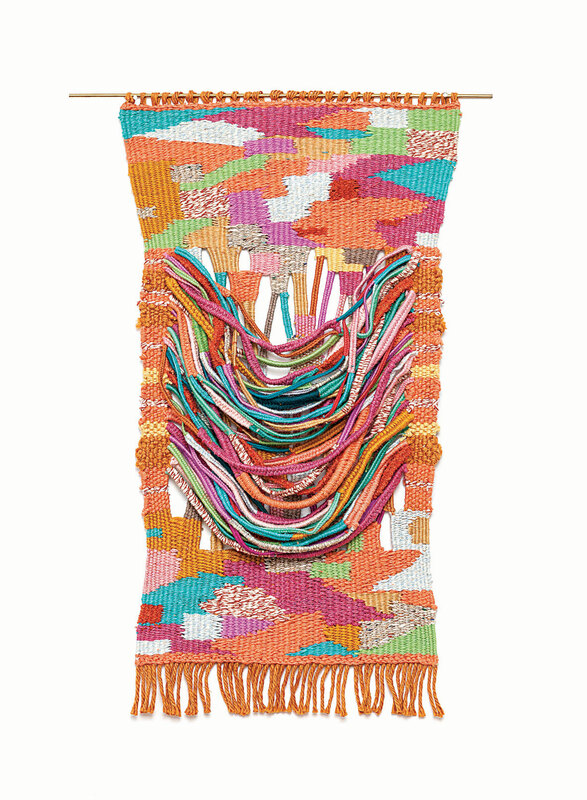 The first thing most people notice about Alicia Scardetta’s weavings and wall hangings is their prismatic array of tropical colors: coral pink, turquoise, neon yellow, magenta. The 26-year-old Brooklyn artist says her playful palette was inspired by the Nickelodeon cartoons she watched as a kid, her family’s Mexican heritage, and her upbringing in sunny San Antonio, Texas. She’s also described her work as riffing on childhood friendship bracelets. Scardetta’s pieces have quickly found a following since she began making them about five years ago. Her work has been shown in several group exhibitions and featured in boutiques around the country and on the popular shopping site One Kings Lane, where they sold well. On Instagram, she has more than 9,000 followers. 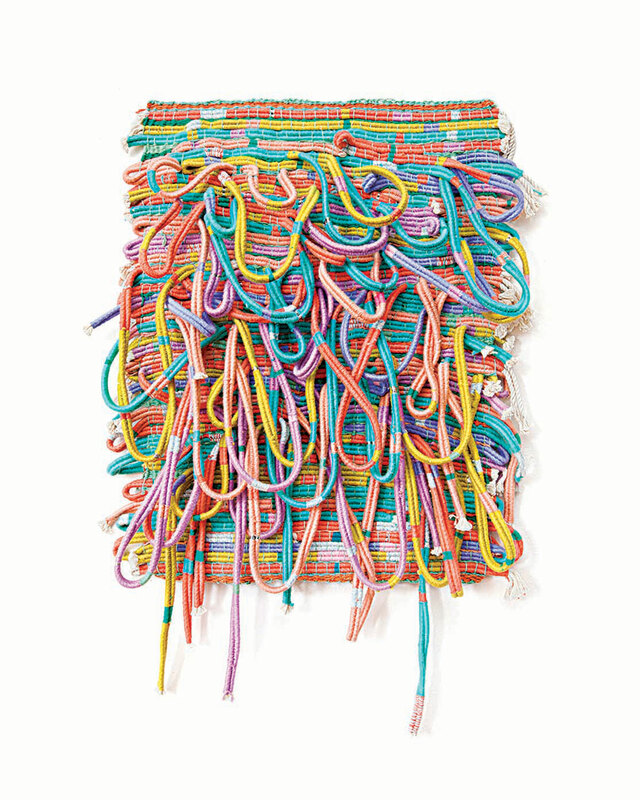 Scardetta got interested in textile art when she was a student at Pratt Institute. 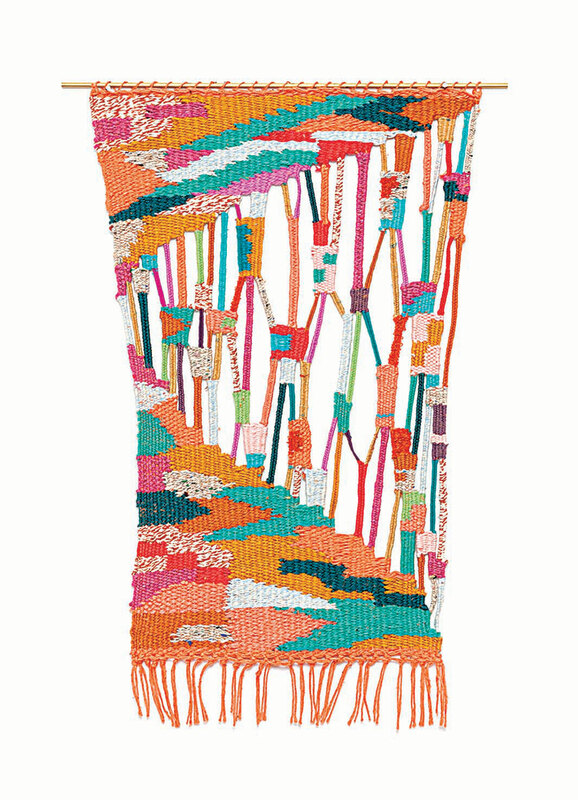 After seeing historical weavings on several blogs, she became curious about the medium and found her way to the Brooklyn branch of the Textile Arts Center. She interned there in 2011 and was immediately hooked. She continued her studies in fine art and drawing, earning her BFA in 2012, while building a frame loom, investing in cotton and wool yarn and metallic threads, and taking classes at the center. “I discovered the wrapping technique because I was interested in negative space,” Scardetta recalls. 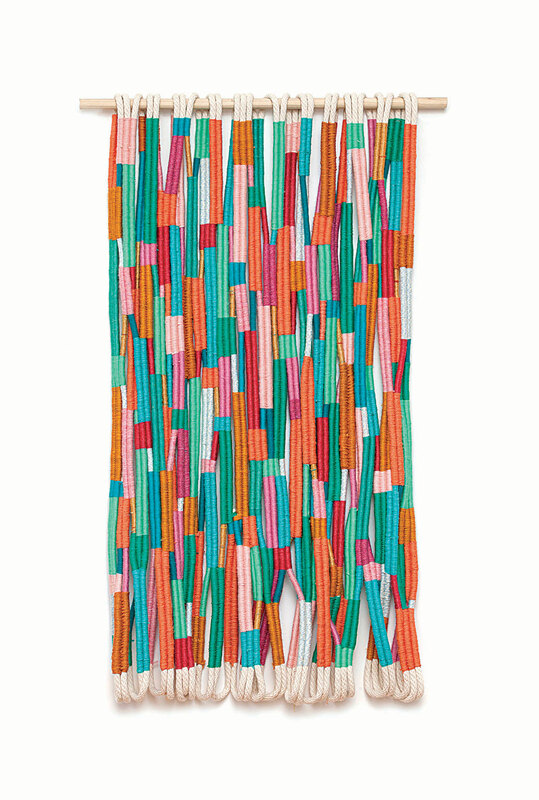 The wrapped cords allow her to create interesting negative forms, and she loves that. In Jaws II (2014), near the top, the weaving breaks into a forest of wrapped cords on an angle; weaving resumes in the lower half, creating an effect like an open jaw chomping through the piece. Day job: Managing the wholesale business of Coral & Tusk, a Brooklyn company that specializes in embroidered home goods. Time spent: Her large pieces – up to 50 by 18 inches – require four to six weeks of steady work in the evenings and on weekends. Heroes: Sheila Hicks, Lenore Tawney, Anni Albers. Craft-school connections: Teaches at the Textile Arts Center, where she’s also had a residency. She’s been a tapestry assistant at Penland School of Crafts and studied at Haystack Mountain School of Crafts. Big plan: She hopes to do more residencies and eventually focus on fiber art full time. Jaws II, 2014, cotton, wool, 20 x 12 in. Melted, 2014, cotton, wool, 21 x 11.5 in. Tamarisk, 2014, cotton, wool, 34 x 18 in. Forever, 2015, cotton, wool, metallic thread, cotton warp, 20 x 18 in.